Daniela Jung comes from Essen and took her first violin lessons with Ms. Anikó Tschürl in Mülheim (Ruhr) and with Prof. Adolphe Mandeau as a preparatory student at the Folkwang Music Academy in Essen. After graduating from secondary school she studied in Mannheim, London and Berlin with Prof. Roman Nodel, David Takeno, Prof. Thomas Brandis and Prof. Nora Chastain. In 1998 and 2000, she won the Chamber Music Competition of the Mannheim Mozart Society and received scholarships for study at the Villa Musica of the German Academic Exchange Service and the Orchestra Academy of the Berlin Philharmonic. After several years of orchestra experience in a number of children’s, youth and student orchestras, among others as concert master of the European Union Youth Orchestra, Daniela Jung became deputy concert master of the NDR Radio Philharmonic in Hanover in 2004, 2005 she moved on to the same position at the Deutsche Oper in Berlin. Since April 1st of 2012 she has been as a member of the Symphonieorchester des Bayerischen Rundfunks. She has appeared as soloist with, among others, the Mecklenburg State Orchestra in Schwerin,, the Kurpfalz Chamber Orchestra, the Baden Baden Philharmonic, the Guildhall Symphony Orchestra in London, the Orquestra Filarmonica de Cámara Madrid-Berlin and the Bach Collegium in Berlin. 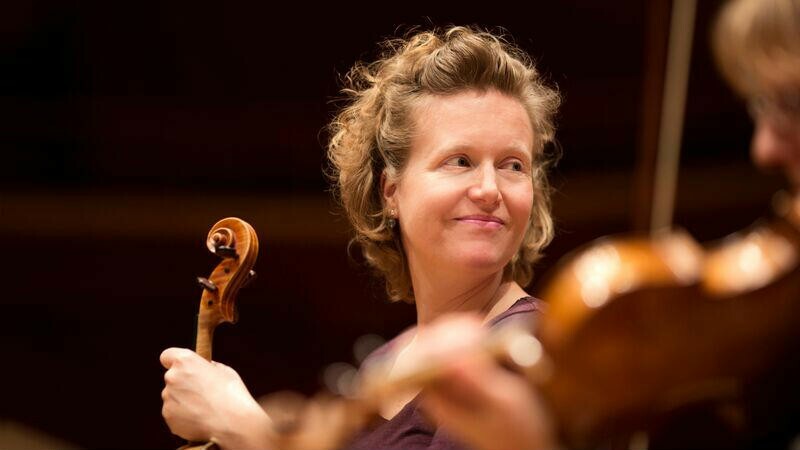 Daniela Jung is a much sought-after chamber musician and performs regularly with the “Ensemble Mediterrain”, the “String Quartet of the Deutsche Oper Berlin”, and she is also a member of the Isang Yun Society of Berlin. CD recordings of works by Schumann, Shostakovich, Schubert, Beethoven and Albéniz document her work. She has played with a number of student and youth orchestras. At festivals at home and abroad, she has proven to be an excellent instructor of violin and chamber music. Daniela Jung plays a violin built by Stephan von Behr in Paris.